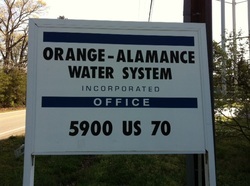 Orange-Alamance Water System, Inc. is a non-profit membership corporation organized in 1965 to serve water to the rural areas of Orange and Alamance counties. Mr. Wiley Perry started out to build a housing development named Perry Hills, which was also to include a shopping center and a school, and ended up helping to form Orange-Alamance Water System, Inc. Orange-Alamance began serving water to it's first customers in August 1968 before there was water in the lake on the Eno. 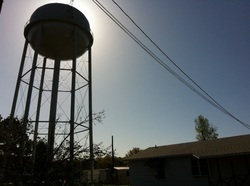 The corporation purchased water from the Town of Mebane from August of 1968 until June of 1969. In May of 1969, the impoundment on the Eno was filled and the water system switched in June of 1969 to using water from it's own supply, furnishing the water to approximately 350 customers. The water system currently serves 3442 customers. The water system sources include Corporation Lake, three wells, and purchased water from the City of Burlington through the Town of Haw River. Lake Orange provides additional water during drought conditions. Orange-Alamance is not part of Alamance or Orange County government. Orange-Alamance is a non-profit membership corporation. Our services are funded mainly by the revenue from the water service. We do not collect any taxes. Orange-Alamance is governed by a Board of Directors consisting of 8 members. The directors are all members of the corporation. Adopting rules and regulations, approving rates, fees and extension of water lines are their main duties. Directors serve a three year term. Election of directors is held at the annual meeting of the membership held on the last Thursday in February of each year. The Board of Directors regular monthly meeting is held on the last Thursday of each month at 5pm at the office located at 5900 US 70, Mebane. Anyone who wants to attend the meeting must contact the office one week prior to the scheduled meeting in order to be placed on the agenda.